Just two weeks ago, Fateme Farmad was one of many travelers affected by President Trump's executive order on immigration that kept her from returning home to Minnesota. "I was confused, I was shocked," she said. "The officer said to me and my mom, 'You might come back to your country, you might not be allowed to enter the U.S.' It was scary." The 33-year-old permanent resident from Iran was detained in Los Angeles with her mother and 1-year-old baby, for 13 hours. On Monday, Farmad went from feeling doubtful about her rights to having some protection. "I'm feeling happy," she said. "More secure that I can now have more rights, more relief and easier travel. Hopefully things don't happen again with the citizens at least." 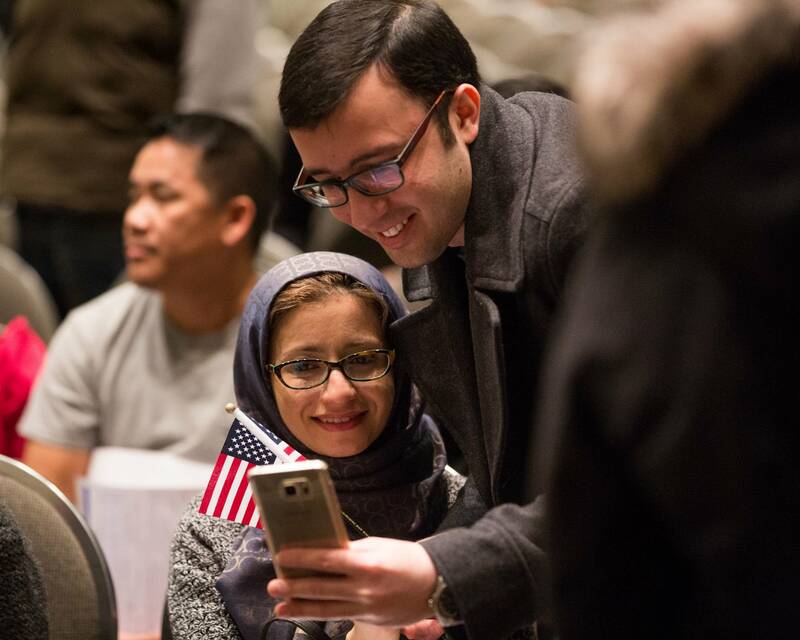 Farmad was one of nearly 900 immigrants who packed a ballroom at River Centre in St. Paul to conclude a five- to seven-month long path to citizenship. Representatives of the U.S. Citizenship and Immigration Services kicked off the ceremony by reading the names of the 89 countries the new citizens represented. • Tell MPR: How did you get here? Among them were five of the seven countries listed in Trump's executive order on immigration. 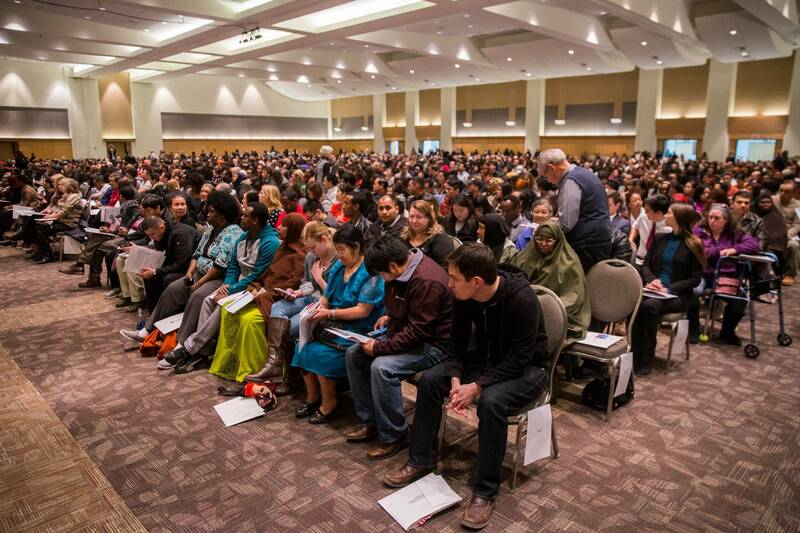 Immigrants from Syria, Sudan, Somalia, Iran and Iraq sat patiently waiting for the certificate of citizenship. 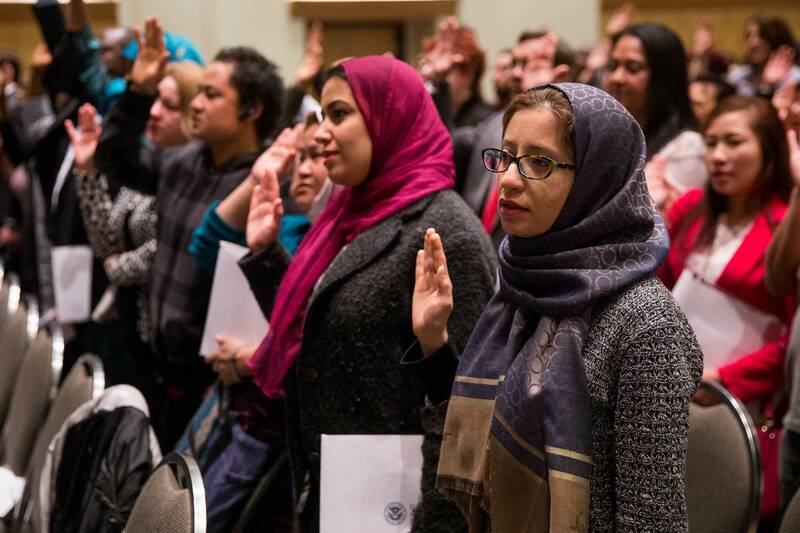 They recited the "Oath of Allegiance" led by U.S. District Judge Hildy Bowbeer and promised to support and defend the constitution and laws against all enemies, foreign and domestic. "I take these obligations freely without any purpose of evasion and declare today that I am a citizen of the United States of America so help me God," Bowbeer said as the immigrants recited. While excitement and optimism filled the room, some were still concerned about what's to come. The travel ban is now on hold as it moves through the courts, but Trump said Friday he's working on a new executive order that could come as early as this week. That's why Farmad, a Muslim, is worried. The fear that the government would target foreign-born citizens who practice Islam crosses her mind frequently. "This is something that the president kept repeating: The Muslims are not very welcome to the U.S. they just make problems, they're terrorist," she said. "Maybe these things will affect our future." But a speech by Bowbeer reassured the crowd about their rights as citizens. She said the country values diversity, tolerance, dignity and respect. "Always remember that this country was founded on the diversity of many tribes, countries and cultures," Bowbeer said. "We've been blessed, both with the rich culture and traditions that were built by native peoples and by the culture and the tradition from a constant infusion of new people from all over the world." And that's exactly why Mohamed Nial feels safe. Nial was one of four Syrians who became U.S. citizens Monday. He came to the U.S. to be with family and during that time he lost his home in the war. He said he's always thought of America as a safe place, unless, the opposite becomes the new norm. For now, the nearly 1,000 immigrants celebrated. They listened to "America the Beautiful," waved tiny American flags, and took pictures with their families. 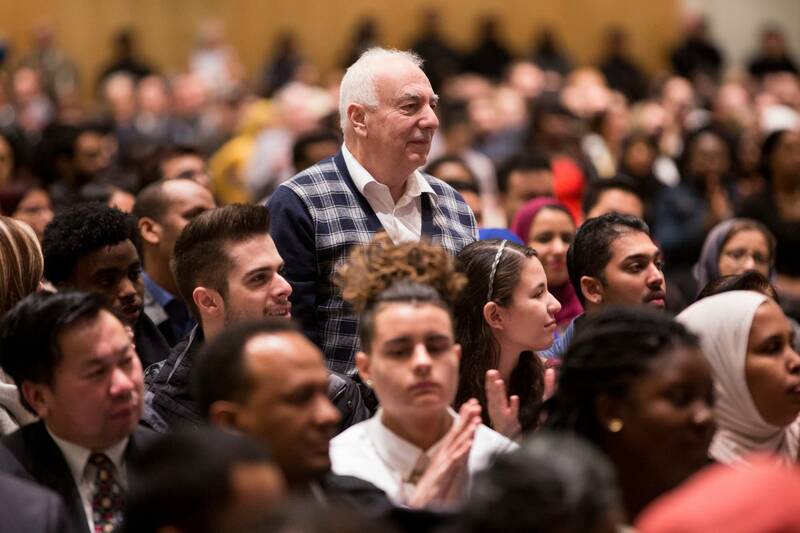 And as organizers read the names of countries new citizens represent, cheers rang out, especially for nations like Mexico and Somalia, countries that were directly affected by Trump's executive orders.